Our range of products include shielded cable, uninyvin cables and unshielded cable. Our advanced quality ranges of Shielded Cable are commonly used in severaltypes of general requirements. These are made of best copper wires which are well insulated and wrapped. These are commonly used in low-frequency transmission application. Our products are highly reliable, advanced in quality, best in performance and are supplied throughout the nation at the attractive price range. Fine strands of ATC copper wire, PVC based core insulation, twisted in layers, overall Myler tape wrapping, then screen braid of annealed tinned copper wire, outer PVC of the special compound. Cores are coded with different colors, without color repetition ensures easy identification as per dc deep cab Color coding standard chart. All Cores may be coded with different numbers & colors. Uninyvin Cables are usually used in Air Craft wiring. The aircraft industry is one of the potential users of these cables. The standard to manufacture and testing Nyvin cables has been derived from BS G 177 i.e. "Nyvin type of electrical cables for aircraft", issued by the British Standards Institution. Apart from Aircraft, in modern days, these cables are widely used in various application of Uninterrupted Power Supply (UPS) like Battery connections, Internal wiring, Battery Bank interconnections etc. Because of its efficiency, nowadays, these cables are also used for Panel Board Wiring and other industrial applications. 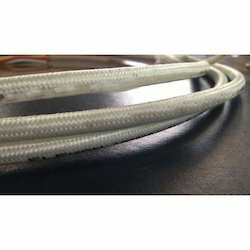 These cables are suitable for use where, in continuous service, no combination of ambient temperature and conductor current produces a stabilized conductor temperature which exceeds 105 deg C. These cables are also suitable for fixed wiring in aircraft when temperatures up to -75 deg C are encountered, but are not suitable for severe flexing at temperatures below -30 deg C.
These cables do not support combustion. These cables are suitable for use in areas where ester-base fluids are present. Maximum working voltage is 600 Volts. Maximum frequency is 1600 Hz and operating temperature range is -30 deg C to 105 deg C.
Nyvin type single core electric cables are made out of Annealed Tinned Copper Conductor, Heat Resistant (HR105 DegC) PVC, Fiber Glass Braids, Nylon Braids, Nylon sheathing And Nylon Lacquer etc. These cables can be supplied in the form of wire or in the form of wiring harness/cable assemblies. Unshielded Cable is the most widely used cable. Known as a balanced twisted pair, UTP consists of twisted pairs (usually four) in a PVC or plenum jacket. When installing UTP cable, make sure you use trained technicians. Field terminations, bend radius, pulling tension, and cinching can all loosen pair twists and degrade performance. Also, take note of any sources of EMI. Choose UTP for electrically quiet environments.